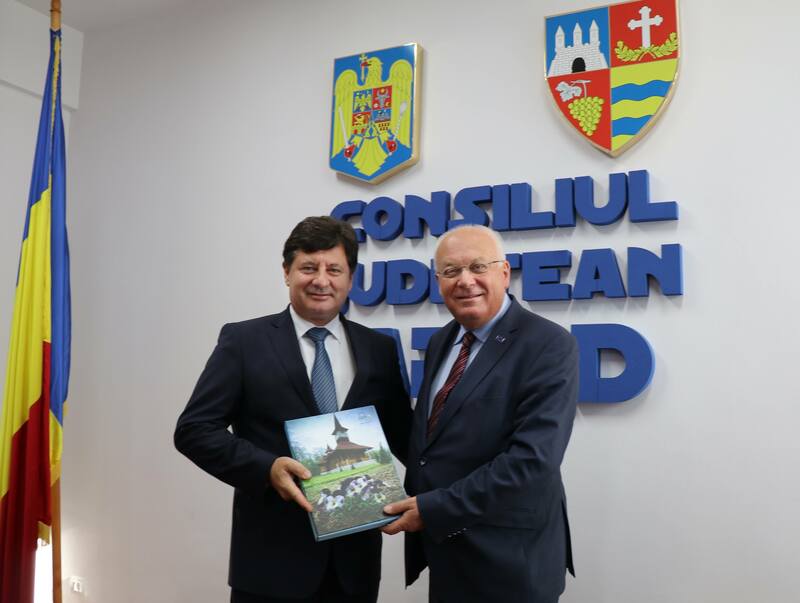 Franz Schausberger met on 5th of October 2018 with the President of the Arad County Council, Justin Cionca, for a detailed conversation. The main topics discussed were the intensification of cooperation between the Arad district and the Institute of the Regions of Europe (IRE). Arad has been a member of the IRE for many years, having held several events in Arad. It was agreed to hold a conference in Arad in 2019, which will focus on the restoration of the important cultural heritage and its tourist use in Arad and its neighbouring regions. It is about the common Central European heritage, especially from the time of the Austro-Hungarian Monarchy. Arad County is planning closer cooperation with neighbouring regions in Hungary and Serbia, as well as neighbouring regions in Romania, as part of an “Activarium” platform. However, this would require greater financial autonomy of the regions. Issues of European values, mobility within the EU, the education system, EU support for the regions, decentralization and much more were the focus of a European People’s Party (EPP) Local Dialogue in Arad City Hall (Romania) on the 5th of October 2018. The large numbers of students present were highly interested in the question of study opportunities in other EU countries and which education system would offer them the best career opportunities. Schausberger pointed out that the education system had to orient itself above all to the needs of the economy and administration of the region. There was particular interest in the ERASMUS program and internships abroad. The political representatives of the National Liberal Party, notably Gheorghe Falcă, Mayor of Arad, and Justin Cionca, President of Arad County Council, pointed out that decentralization is not only between the EU and its Member States, but also within the states must be done. Above all, a fair financial decentralization is important, since in Romania, the distribution of funds is currently taking place, especially on the part of political parties. However, Arad’s politicians highlighted the huge financial support from the EU funds that made possible the renovation of important cultural monuments and cultural facilities, such as the Concert Hall and Moise Nicoara College.